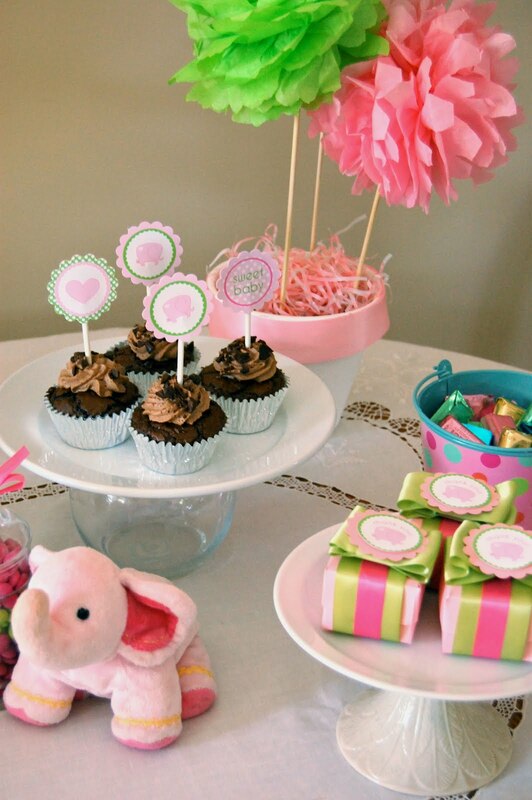 The pink elephant baby shower turned out really nicely. 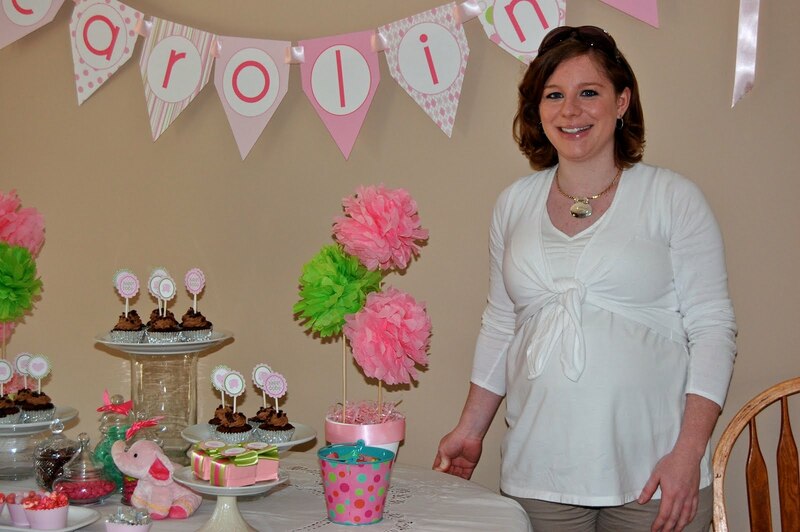 It was very simple, but Erica, the mother-to-be, was really touched by the effort. 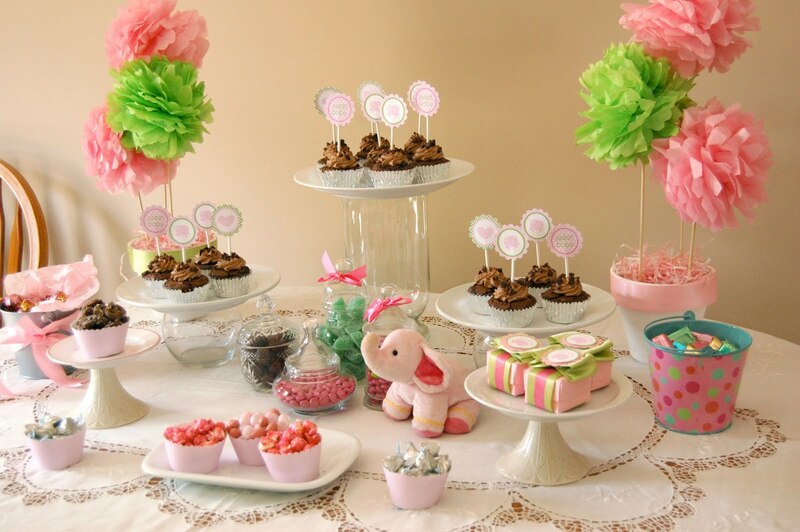 The dessert buffet had a chocolate theme…Godiva pink wrapped truffles, pink and green M&Ms, pink robin eggs, buttercream kisses, chocolate covered pretzels with pink sprinkles, and mini candy bars were offered. The display assembly was uncomplicated, but had a nice effect. 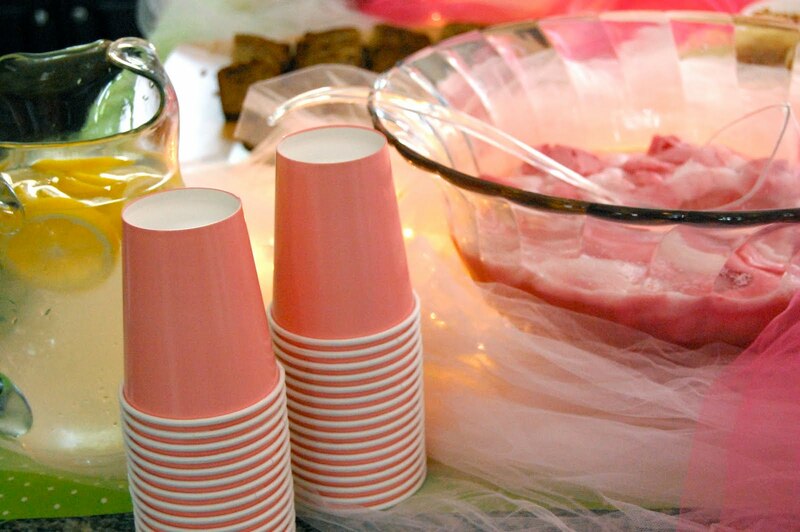 I used white plates sitting on top of vases and candlesticks for height, and the pink polka dot elephant cupcake wrappers to hold candy instead of cupcakes. 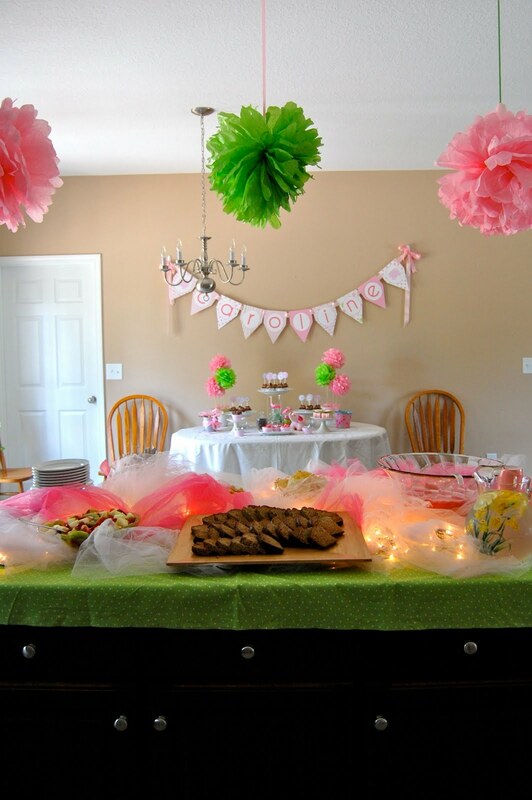 Add a beautiful tablecloth and a little stuffed pink elephant…and it was complete. Did I mention the chocolate theme? Erica’s pregnancy craving seems to be brownies. 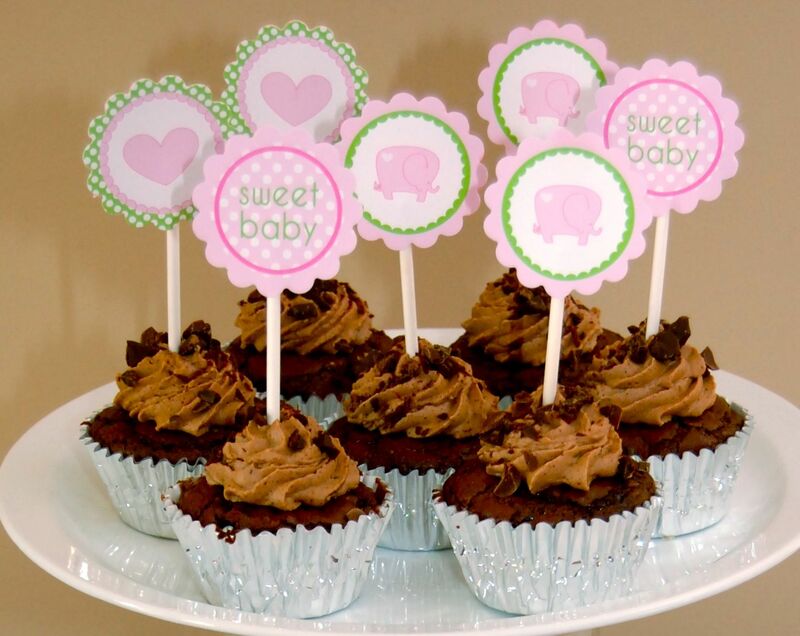 I made triple-chunk chocolate brownies in cupcake wrappers and then topped them with whipped ganache frosting and chopped chocolate pieces, and then finished with a cupcake topper for some flair. 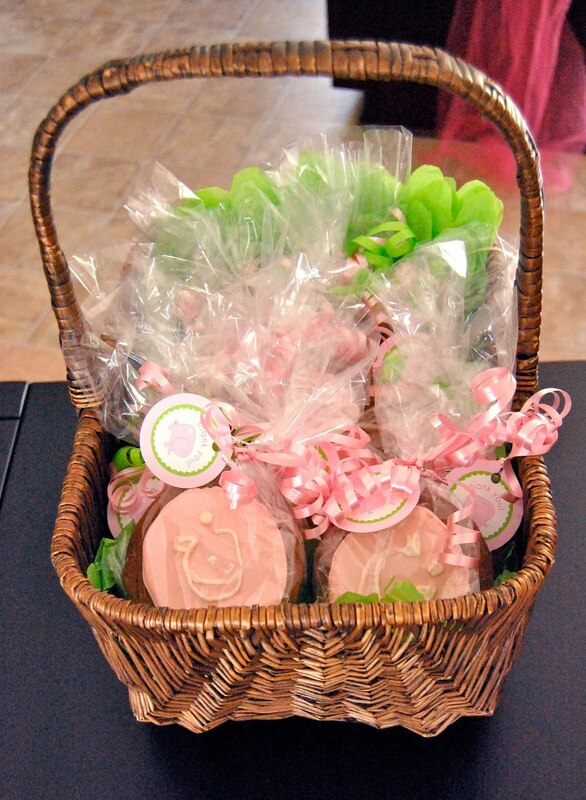 For party favors, I made chocolate sugar cookies with a big “C” monogram for the baby’s name, Caroline. They were tied off with a little “thank you” party circle. And it’s just not a party unless there is a tissue pouf ball. We kept it to three this time over the food. 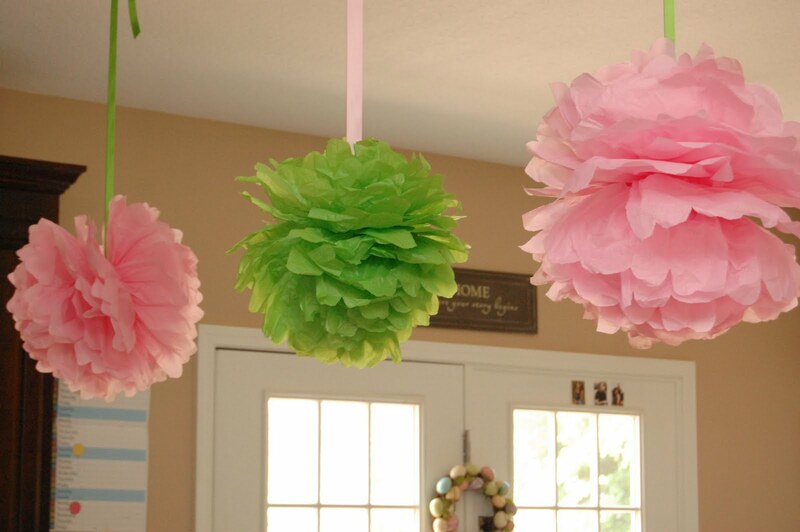 You can see the tutorial on how to make these, along with those in the table arrangements here. Congratulations, Erica! And we can’t wait to meet your little girl! I think this is sooo cute. I want to have an elephant first birthday party for my daughter in December. I would love to know if you could custom make me something to help cordinate her party. Email me! Thanks. Beautiful!!! Gorgeous pictures, darling colors! Congrats to the mama! Hi. 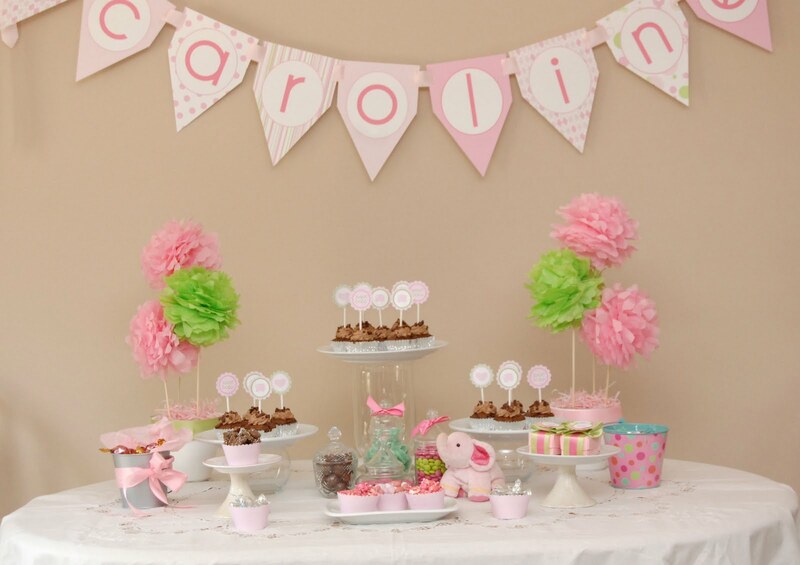 I love your pink elephant idea…I love the “Caroline” banner. I really need to make that! Did you order or make the banner? Can you share the details. Thanks, and congrats!